Access to a Team in Asana is contextual and there are a few permission settings that affect who can access a Team and its public projectspublic projects Public Projects are visible to all Team and project members. Read more and Team ConversationsTeam Conversations You can start a team Conversation to make an announcement, discuss multiple projects, or share team-related information. Read more . If somebody belongs to a Team, then they have access to all Team Conversations and public projects within that Team. Organization GuestsGuests Guests are people working in your Organization who do not share your company's email domain. Read more must belong to a Team to access its public projects and Team Conversations. If they do not belong to a Team, they cannot access that Team nor can they request to join it, regardless of what permissions that Team is set to. 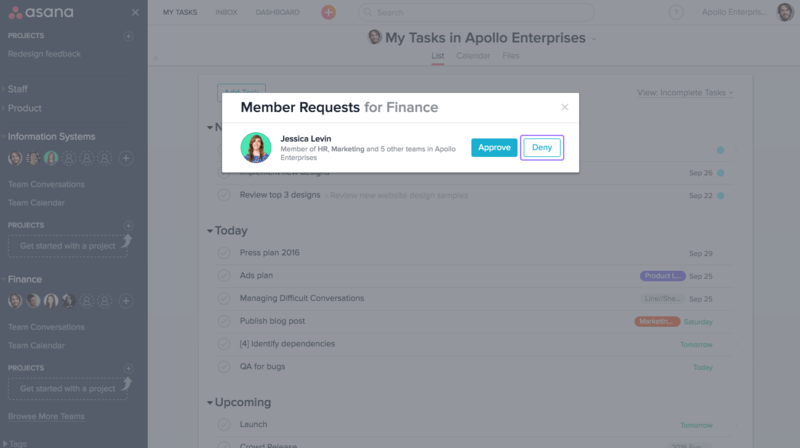 Public Team and Hidden Team options are only available in the premium version of Asana. To identify who belongs to a Membership by Request Team and can see its projects, you must access its Team SettingsTeam Settings team settings are adjustments that only affect a team, not an entire Organization. Read more . From the sidebarsidebar Use the sidebar to navigate to the dashboard, starred items, projects, and teams. The sidebar can be collapsed. Read more , hover over a Team’s name, then click the gear icon that appears and select Edit Team Settings. From the Team Settings, the Privacy field identifies a Team’s permissions. Who has access to a Membership by Request Team? Only Team MembersTeam Members Someone that has access to all public projects and conversations in a Team. Read more can access a Membership by Request Team’s public projectspublic projects Public Projects are visible to all Team and project members. Read more and Team ConversationsTeam Conversations You can start a team Conversation to make an announcement, discuss multiple projects, or share team-related information. Read more . You can see the full list of Team Members from the Members tab of the Team Settings. Who can request to join a Membership by Request Team? All Organization MembersOrganization Members People in your Organization that have a shared company email domain. 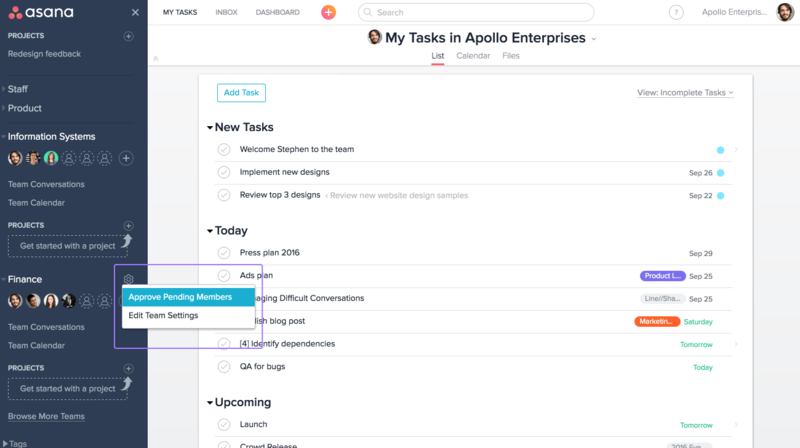 Read more can see a Membership by Request Team in their sidebarsidebar Use the sidebar to navigate to the dashboard, starred items, projects, and teams. The sidebar can be collapsed. Read more and request to joinrequest to join Request to join a Team to access its projects. Requests to join a Team must be approved by an existing team member Read more it. Before someone can access a Membership by Request Team’s public projectspublic projects Public Projects are visible to all Team and project members. Read more and Team ConversationsTeam Conversations You can start a team Conversation to make an announcement, discuss multiple projects, or share team-related information. Read more , their request to join must be approvedapproved A team member's ability to approve incoming requests to join a Team in their Organization. Read more by an active Team MemberTeam Member Someone that has access to all public projects and conversations in a Team. Read more . Members do not see Teams they don’t have access to in the sidebar and therefore cannot request to join or even see a Membership by Request Team in their sidebar. How do I share a Membership by Request Team? Invite new Team Members - inviting someone to a Membership by Request Team will grant them access to that Team’s public projectspublic projects Public Projects are visible to all Team and project members. Read more and Team ConversationsTeam Conversations You can start a team Conversation to make an announcement, discuss multiple projects, or share team-related information. Read more . Change to a Public Team - changing to a Public Team means all Organization MembersOrganization Members People in your Organization that have a shared company email domain. Read more will automatically be able to access that Team’s public projects and Team Conversations without having to be approved. Organization Guests still won’t be able to join or even see a Public Team in their sidebar. Navigate to the Settings tab of the Team Settings and select Public to Organization, then click the Update Team button. How do I limit access to a Membership by Request Team? Deny the person’s request to join the Team from the sidebarsidebar Use the sidebar to navigate to the dashboard, starred items, projects, and teams. The sidebar can be collapsed. Read more . Remove Team Members - removing someone from a Membership by Request Team will take away their access to all of that Team’s projectsprojects Projects are lists of tasks. Read more (both public and private) and Team ConversationsTeam Conversations You can start a team Conversation to make an announcement, discuss multiple projects, or share team-related information. Read more . Change to a Hidden Team - changing to a Hidden Team means other Organization Members will no longer be able to request to join that Team from the sidebar. Navigate to the Team settings cog beside the Team name in your sidebar. If someone has requested to join the Team, Approve Pending Members will show. Click Deny to deny the person access to the Team. Navigate to the Members tab of the Team Settings, then hover over the Team Member’s name and click the Remove button. Navigate to the Settings tab of the Team Settings and select Hidden, then click the Update Team button. To identify who belongs to a Hidden Team and can see its projects, you must access its Team SettingsTeam Settings team settings are adjustments that only affect a team, not an entire Organization. Read more . Who has access to a Hidden Team? Only Team MembersTeam Members Someone that has access to all public projects and conversations in a Team. Read more can access a Hidden Team’s public projectspublic projects Public Projects are visible to all Team and project members. Read more and Team ConversationsTeam Conversations You can start a team Conversation to make an announcement, discuss multiple projects, or share team-related information. Read more . You can see the full list of Team Members from the Members tab of the Team Settings. Who can request to join a Hidden Team? The only way to gain access to a Hidden Team is by being invited in from a Member of that Team. However, Limited Access Members can also see hidden teams and request to join. How do I share a Hidden Team? Invite new Team Members - inviting someone to a Hidden Team will grant them access to that Team’s public projectspublic projects Public Projects are visible to all Team and project members. Read more and Team ConversationsTeam Conversations You can start a team Conversation to make an announcement, discuss multiple projects, or share team-related information. Read more . Change to a Membership by Request Team - changing to a Membership by Request Team means all Organization Members can request to join that Team from their sidebarsidebar Use the sidebar to navigate to the dashboard, starred items, projects, and teams. The sidebar can be collapsed. Read more , but their request must be approvedapproved A team member's ability to approve incoming requests to join a Team in their Organization. Read more before they can access that Team’s public projects and Team Conversations. Organization Guests still won’t be able to request to join or even see a Membership by Request Team in their sidebar. Navigate to the Settings tab of the Team Settings and select Membership by Request , then click the Update Team button. Navigate to the Settings tab of the Team Settings and select Public to Organization , then click the Update Team button. How do I limit access to a Hidden Team? Remove Team Members - removing someone from a Hidden Team will take away their access to all of that Team’s projectsprojects Projects are lists of tasks. Read more (both public and private) and Team ConversationsTeam Conversations You can start a team Conversation to make an announcement, discuss multiple projects, or share team-related information. Read more . To identify who belongs to a Public Team and can see its projects, you must access its Team SettingsTeam Settings team settings are adjustments that only affect a team, not an entire Organization. Read more . Who can access a Public Team? Technically, only Team Members can access a Public Team’s public projects and Team Conversations. However, Organization MembersOrganization Members People in your Organization that have a shared company email domain. Read more can also join automatically without being approved to gain access to its public projects and Team Conversations. Who can request to join a Public Team? All Organization MembersOrganization Members People in your Organization that have a shared company email domain. Read more can see Public Teams in their sidebarsidebar Use the sidebar to navigate to the dashboard, starred items, projects, and teams. The sidebar can be collapsed. Read more and request to joinrequest to join Request to join a Team to access its projects. Requests to join a Team must be approved by an existing team member Read more it. Requests to join a Public Team are automatically approved, so you’ll have access to that Team’s public projectspublic projects Public Projects are visible to all Team and project members. Read more and Team ConversationsTeam Conversations You can start a team Conversation to make an announcement, discuss multiple projects, or share team-related information. Read more immediately after selecting to join it from the sidebar. Organization Guests do not see Teams they don’t have access to in the sidebar and therefore cannot request to join or even see a Public Team in their sidebar. How do I share a Public Team? Invite Organization Guests - inviting an Organization Guest to a Public Team will grant them access to that Team’s public projectspublic projects Public Projects are visible to all Team and project members. Read more and Team ConversationsTeam Conversations You can start a team Conversation to make an announcement, discuss multiple projects, or share team-related information. Read more . You can technically invite an Organization Member to a Public Team, but since that Team is public, they can already join without approval to gain access to its public projects and Team Conversations. How do I limit access to a Public Team? Remove Organization Guests - removing an Organization Guest from a Public Team will take away their access to all of that Team’s projectsprojects Projects are lists of tasks. Read more (both public and private) and Team ConversationsTeam Conversations You can start a team Conversation to make an announcement, discuss multiple projects, or share team-related information. Read more . Change to a Membership by Request Team - changing to a Membership by Request Team means all Organization MembersOrganization Members People in your Organization that have a shared company email domain. Read more s can request to join that Team from their sidebarsidebar Use the sidebar to navigate to the dashboard, starred items, projects, and teams. The sidebar can be collapsed. Read more , but their request must be approvedapproved A team member's ability to approve incoming requests to join a Team in their Organization. Read more before they can access its public projects and Team Conversations. Change to a Hidden Team - changing to a Hidden Team means other Organization Members will no longer be able to request to join that Team from the sidebarsidebar Use the sidebar to navigate to the dashboard, starred items, projects, and teams. The sidebar can be collapsed. Read more . You can technically remove an Organization Member from a Public Team, but since that Team is public, they can just join again without being approved to restore their access to its public projects and Team Conversations. This section of the Asana Guide explains task permissions.